Gift differently this Diwali ! Make it special for you and your loved ones by giving the festive spirit a beauty twist ! Sweets, chocolates and even dried fruits and nuts are passe now. People are thinking up new ways of gifting – gifts that make more sense, are utilitarian and spell class. Diwali and Christmas are festivals that combine worship and socializing in equal measure. After rituals and prayers with family, it’s time to head out to private parties with a lot of singing, dancing and making merry. It’s also the time to carry gifts when invited to homes. So much socializing also means new clothes, staying trendy and grooming. Check out the brimming shopping malls and beauty salons around you and you will agree with me. Offers and gift combos galore! At this point in time when personal grooming is a priority for most people, why not think out of the box and gift them some beauty ? In the form of skin care, and ‘natural skin care’ at that ! Festive and party season also means fried food, alcohol, more makeup and less exercise. Skin can get dehydrated ! Increase in pollution due to the bursting of crackers and burgeoning traffic also means a lot of dirt getting embedded into the pores of our skin. Another reason gifting natural skin care will do all of us a lot of good. 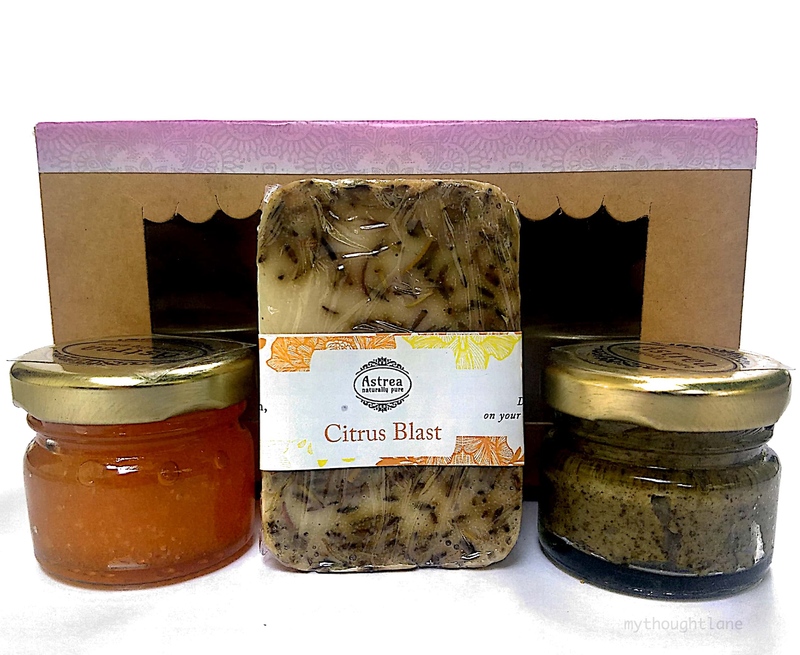 I am about to suggest Astrea gift hampers, full of skin care products with natural ingredients and zero chemicals. Just the kind of products that will soothe and nourish skin. Take a look. 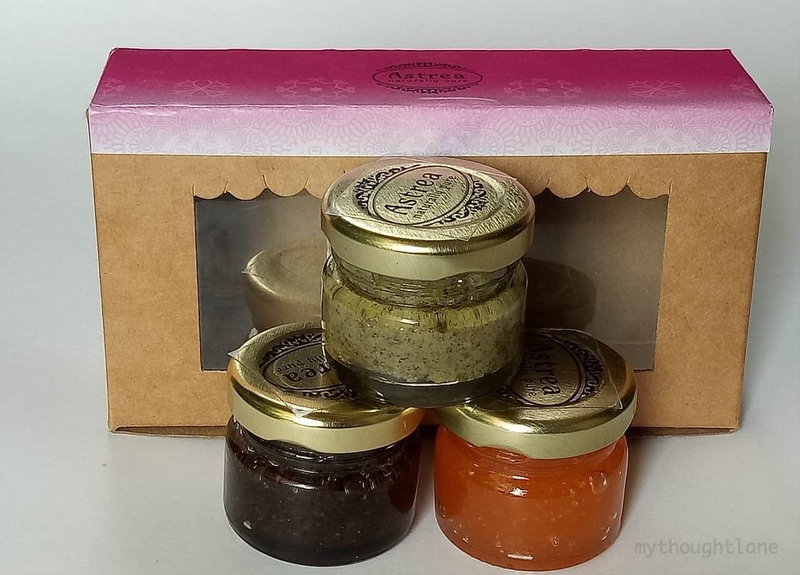 A set of three body scrubs to free your skin of all pollutants and dead skin cells. Beauty is about keeping the whole of you radiant and beautiful, and not just the face ! These body scrubs are gentle on the skin and leave your hands and legs hydrated. Whats more, they lend that subtle glow to the skin giving it a healthy radiance. But avoid using them for the face. Astrea has cleansing grains which help exfoliate face and neck. How To Use : In the shower or while in the bath, scoop out a tablespoonful of the product into a small bowl. Smear the scrub all over your body, massage gently and let the sugar granules emulsify. Rinse completely and do not use any soap or body wash soon after. The idea is to let a hint of the oils nourish your skin. Using a foaming cleanser will nullify its purpose, that of hydrating and nourishing. Use them once or twice a week, not everyday. Two body scrubs and a Spa Bar. The Spa Bar is enriched with castile soap, lavender buds, orange peel and glycerine. Use the lavender bud embedded side to mildly exfoliate. Now turn it over and use the other side to moisturise and hydrate. Cooler months have set in all over the country and this seems to be the ideal time to gift some beauty, some spa options ! How To Use : Use it in the shower and do not soap yourself after that. And now for some glam the natural way. 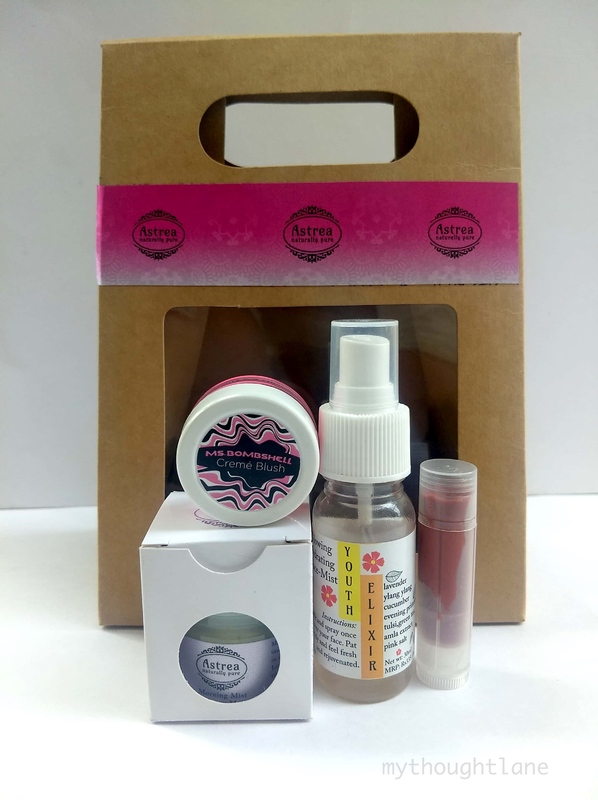 Astrea has made its foray into makeup and launched two new products, the Creme Blush and Lip Tint. This Diwali gift hamper also contains a face mist and a moisturiser. The four products together lend a soft matt dewy look and is being touted as the Diwali daytime look. Isn’t it such a safe option ? Giving makeup lovers more reason to use less chemicals on their faces ? And nothing better for those who like makeup, but are concerned about skin being exposed to chemicals ? If you want to get a tutorial on how to get the dewy matt look, you can call Astrea for instructions. Number provided at the bottom of the post. More customisable gifting options also are available. Here are my suggestions keeping in mind the season of festivities which means more makeup, more partying, hence more intense deep cleansing. Astrea is more than happy to help you with customisable gift options. Set a budget and let them pack a bundle of natural skin care gifting for you this Diwali.